Do your kids hate taking baths? Do they fight you every step of the way and then continue to scream and cry because they are taking a bath? 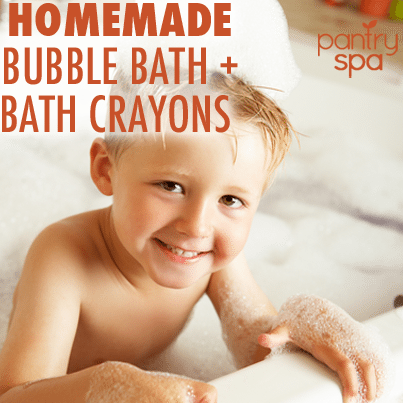 Then you need this homemade, all-natural bath crayons recipe. Your kids are going to be asking to take baths every day. For the recipe below, your crayons may not turn out looking professional, but they will work. Many people have said using a mold makes the crayons look nicer, but if you aren’t worry about your bath crayons looking fancy, the recipe below works fine without a mold. There is nothing like homemade bath crayons to get your kids excited about a bath, and you can even treat yourself later with a homemade bubble bath recipe. Natural Food Coloring. You need several drops for each bath crayon and numerous colors make it more fun. Grate the bar of soap. The finer the soap is grated, the better it will work. You should end up with about one cup of grated soap. Divide the grated soap into different bowls. Each bowl will be a different colored crayon. Add hot water to each of the bowls. Start slow by adding a few drops at a time and then mash the soap shavings and water together until all the pieces are used. Too watery? Add more soap. Not sticky enough? Add more water. Add the food coloring to each bowl and then mix till your get the desired hue. Try to mixing food colorings to see what kinds of colors you get. Mold the crayons using your hands. You can make balls or sticks or you can use molds to make fancy shapes. Place the crayons in the freezer overnight. Who doesn’t like a bubble bath? Exactly. Everyone loves a bubble bath. Check out the awesome, easy to make and all natural bubble bath recipe below.